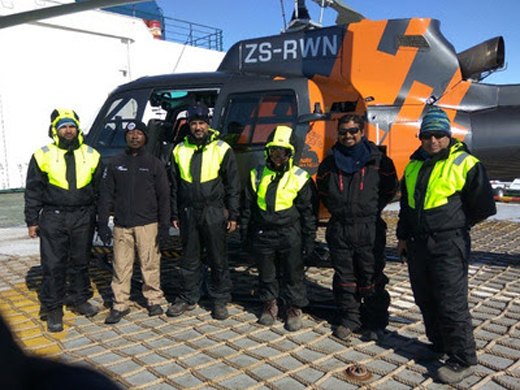 MANIPAL, Mar 23, 2018: K Balakrishna, professor, department of Civil Engineering, Manipal Institute of Technology, MAHE, had an experience of his lifetime when he spent 95 days at the Indian research bases, Bharati and Maitri, in Antarctica, recently. He was chosen to be part of the 37th Indian Scientific Expedition to Antarctica along with 40 other scientists from IMD, GSI, IIG, BARC, BSI, ISRO, NCAOR and logistics personnel from Army, Border Roads Organization and others. He was the only scientist from a deemed private university for the expedition, organized by the National Centre for Antarctic and Ocean Research (NCAOR), a research institute of Ministry of Earth Sciences and based in Goa. “The selection procedure was tough as it entailed not only research work but also physical fitness including two weeks of snow acclimatization at the Mountaineering and Skiing Institute of Indo-Tibetan Border Police at Auli, Uttarakhand. Acclimatization included mountaineering, trekking across the Himalayan terrains, rock-climbing etc,” he said. Bala describes the entire experience as “thrilling” and the trip to Antarctica “most unforgettable”. He added; “It was a rewarding experience for me both professionally and personally. Although it was tough initially with temperatures below minus 10 degrees, no nights and frozen food, I acclimatized quickly and got down to my research, which was, obtaining a baseline of the micro-pollutants like pharmaceuticals, personal care products and other naturally occurring metals in the seawater, sea-ice, lakes, sediments and soil of the region. He collected over 100 samples at different locations within a radius of 20 km from the Bharati station. The samples are being analyzed at Manipal College of Pharmaceutical Sciences lab here. Krishnamurthy Bhat is the co-investigator of the project. The sampling was done by travelling across the region through skidoo (snow scooter) and helicopter. Bharati station has 24x7 broadband internet access with comfortable rooms, moderated temperatures, library, Indian food etc. The Indian expedition also used MV Ivan Papanin, the ship chartered by India for the Antarctica expedition.